Zinc atoms have 30 electrons and the shell structure is 2.8.18.2. 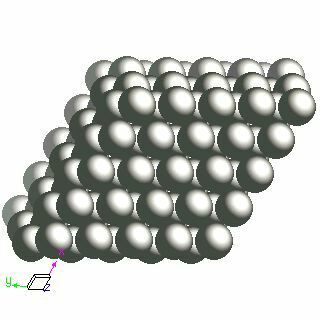 The ground state electronic configuration of neutral zinc is [Ar].3d10.4s2 and the term symbol of zinc is 1S0. Zinc: description Your user agent does not support the HTML5 Audio element. Zinc-deficient animals require 50% more food to gain the same weight of an animal supplied with adequate amounts of zinc. Zinc is not particularly toxic and is an essential element in the growth of all animals and plants. Plating thin layers of zinc on to iron or steel is known as galvanising and helps to protect the iron from corrosion. Zinc is a bluish-white, lustrous metal. It is brittle at ambient temperatures but is malleable at 100 to 150°C. It is a reasonable conductor of electricity, and burns in air at high red heat with evolution of white clouds of the oxide. 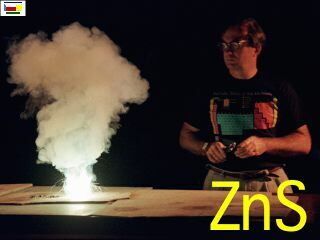 The picture above shows the result from burning a mixture of zinc metal powder and sulphur (only to be demonstrated by a professionally qualified chemist). The solid state structure of zinc is: bcc (body-centred cubic). Zinc is essential in the diets of plants and animals. Zinc shortage in soils around the world is an important problem. Zinc is the key component of many enzymes. The protein hormone insulin contains zinc. Zinc plays a role in reproduction and also sexual maturation. Zinc deficiency resluts in stunted growth and in male sexual immaturity. This is reversed on the addition of zinc in the diet. Some organisms seem to accumulate zinc. Reactions of zinc as the element with air, water, halogens, acids, and bases where known. Binary compounds with halogens (known as halides), oxygen (known as oxides), hydrogen (known as hydrides), and other compounds of zinc where known. Bond strengths; lattice energies of zinc halides, hydrides, oxides (where known); and reduction potentials where known. Zinc was discovered by Andreas Marggraf in 1746 at Germany. Origin of name: from the German word "zink". 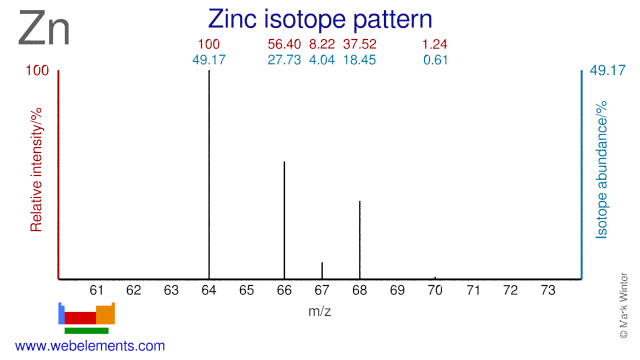 Isotope abundances of zinc with the most intense signal set to 100%. Zinc isotopes are used extensively in both industrial and medical applications. Depleted Zn-64 is added to the cooling water of nuclear reactors in the form of oxide or acetate to prevent stress corrosion cracking. It also reduces the release of (stable) Co-59 into the cooling water by forming a thin spinel layer on the Co containing steel surfaces. Neutron irradiation of Co-59 will result in the formation of Co-60, a radioisotope which emits high energy gamma radiation and is a major contributor to the dose rate of personnel working in the reactor. Enriched Zn-67 is often used in biological research into the uptake of Zn in the human body. It can also be used for the production of radioactive Ga-67 in smaller cyclotrons. However, by far most Ga-67 is made from Zn-68. Zn-67, Zn-68 and Zn-70 can all be used for the production of the therapeutic isotope Cu-67. Zn-66 has been proposed as an alternative target for the production of Cu-64 and Ga-67. Finally Zn-70 is also used in biological research and in research into super-heavy elements. 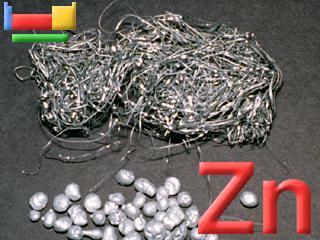 Isolation: zinc metal is readily available commercially so it is not normally necesary to make it in the laboratory. Most zinc production is based upon sulphide ores. These are roasted in industrial plants to form zinc oxide, ZnO. This may be reduced with carbon to form zinc metal, but in practice ingenious technology is required to ensure that the resulting zinc does not contain oxide impurities. The other type of extraction is electrolytic. Dissolution of crude zinc oxide, ZnO, in sulphuric acid gives zinc sulphate, ZnSO4 in solution. Cadmium is an impurity and this is removed as a precipitate of cadmium sulphate by the addition of zinc dust. Electrolysis of the ZnSO4 solution using aluminium cathodes and lead alloyed with silver anodes gives pure zinc metal coated on the aluminium. Oxygen gas is liberated at the anode. Very pure zinc may be formed from crude zinc by zone refining and single crystals can be grown with purities of better than 99.9999%.